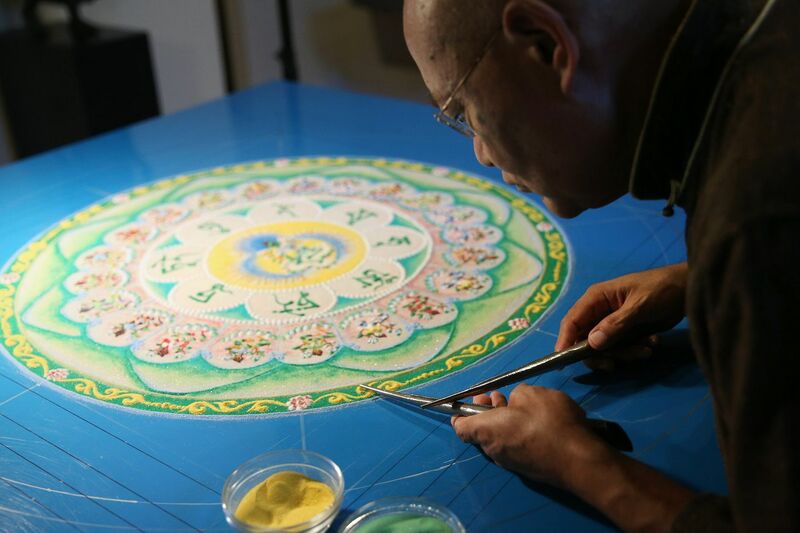 Spiritual director Losang Samten uses tools called chak-pur to create a sand mandala depicting the Green Tara, a beloved Buddhist diety, at the Chenrezig Tibetan Buddhist Center of Philadelphia. The mandala, which symbolizes healing and protection, will be completed at the end of the week and then will be dismantled during a ceremony Sunday. A former Tibetan Buddhist monk, Samten is a master of the mandala, a spiritual sand painting whose creation is part meditation, part art. Since Sunday, he and apprentice Soo Kyong Kim have spent five hours each day sprinkling grains of sand in 30 colors onto a 5-foot-by-5-inch glass table at the Chenrezig Tibetan Buddhist Center in Northern Liberties. Ever so slowly this week, an image has been emerging of the Green Tara, a beloved Buddhist deity, the mother-savior-protectress, who represents wisdom and compassion. "There is a lot of fear, concern, anger, and hatred," Samten, 66, said during an interview at the center's new headquarters on Marshall Street, where he is spiritual director. "We want to make peace." Then, Samten said, they will "dismantle" it. Samten and Kim are working on the mandala from 1 to 6 p.m. daily through Saturday, and the public is invited to watch. On Sunday at about noon, those gathered at the center will scoop up the delicately placed grains in a ritual that signifies life's impermanence. They may take home envelopes of sand as a blessing, while leftover grains that once depicted a goddess will be dumped in a body of water to bless the environment. Born in Tibet, Samten fled China at 5 with his family in 1959 during the Communist takeover. The family settled in India, where Samten entered the exiled Dalai Lama's Namgyal Monastery. He served as an assistant to the Dalai Lama and began learning the sacred art of the mandala as a teenager. He was sent to the U.S. to spread the gospel of the mandala in 1988 when New York writer/artist and Buddhist practitioner Barry Bryant asked the Dalai Lama to send someone skilled in the practice. Samten settled in Philadelphia after he created a mandala at the Penn Museum and a group of professors pleaded with the Dalai Lama to allow him to stay. Since then, Samten has completed hundreds of mandalas around the world, at universities, museums, schools, and prisons, with the longest taking five weeks. Coming up are mandalas in California, New Jersey, Brazil, and in Philadelphia at the Folk Arts-Cultural Treasures Charter, where Samten is a teacher in residence. He gave up being a monk 20 years ago because he was "more comfortable" as a lay teacher in his adopted home. When he's creating, Samten says, his mind is empty. There is only a mental quietness. It is a skill that Kim hasn't yet mastered. When she's creating a mandala, her mind is racing. "I'm thinking about all sorts of things, like if the line of sand" she's sprinkling on the mandala is a straight one, Kim said. Samten has slowed his mandala creation, in part, because of age — his eyes, he said, aren't want they used to be — but also because he is busy with other projects. He leads retreats and workshops and runs the center, which is frequented by people of all faith traditions. He worries about the future of sand painting that right now flourishes only in India. Kim gives him hope. A violist, music teacher, and graduate of Juilliard, she has been a member of the center for 20 years and studied with the mandala master throughout. Her apprenticeship became official last year as part of a program with the Philadelphia Folklore Project. "It's art. It's beautiful," Kim said, "and I want to keep up a tradition that is fading."